The plaza across the street from the Alamo was the busiest place in downtown San Antonio, but I was told I would be ticketed if I set up my tent there, even though it was a public park. 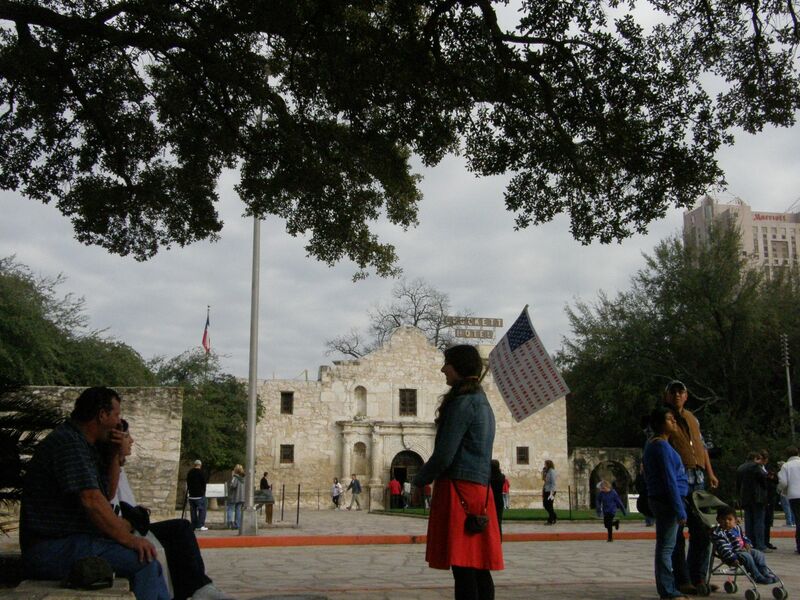 I was even told I could not have my flag in the park directly around the Alamo, which is federal public property. The non-profit that manages the federal lands on which the Alamo stands forbids any form of public survey, and the security officer considered my sign to be included. One of the challenges of trying to talk with people I don’t already know about politics is that there are so many limits on public assembly, even in places that are officially owned by the citizens of this country. After being shut down, I left the park and went back out to the plaza. There was a mixture of tourists and locals, many of whom were working to serve the tourists. I talked with a couple of people briefly, including a tour bus driver and a woman who said she was too fed up with politics to care about the current political situation. She said she would have used to considered herself to be a Republican but felt that politics was too much of a mess for her to believe in any of the candidates and didn’t plan to vote. The tour bus driver agreed, at least conversationally. When I read him my flag sign his remark seemed to imply that I was being a little uppity. They talked with each other about how the San Antonio Occupy Movement had been pretty unproblematic, but that they were no longer allowed to keep an overnight encampment, they had to go home and then return in the morning. The bus driver volunteered that there was some gang violence in the city, but that it wasn’t racial, it was just about the money. Their comments made it seem that they felt the political situation was not so bad as to be a bother, but still too bad for them too think it mattered whether they voted or were politically involved. I know that many people consider politics boring and/or impolite to talk about. Sometimes I also feel politics is too tedious and or too disheartening to give it my direct attention. This disengagement is even more common in this country than the problem of polarization between the right and the left. I have yet to figure out how to address this a huge shadow underbelly of democracy.